We had the delight of visiting the community of Okawás for the official ribbon cutting and handover ceremony for the new system. We got in a truck at 5;30 in the morning and drove for a couple of hours to a river crossing beyond which there was no road, crossed the river in a long motorized canoe, and then got on mules for the hour-long ride to the village. The trail started out pretty easy, but turned into some pretty impressive muddy and rocky ups and downs. With our little experience with horses we were a little nervous about how they were going to navigate the difficult terrain, but they did better than we would have. Once there, the whole team went into action. Gregoria and Lilian, the health promoters, began to visit each household to check on how all the health education was going and to see if the outhouses were working out, etc. Most of the rest took the time before the celebration to go up and inspect the entire system, including the tank, the water capture point (a sealed-over spring), and the piping. It all looked mighty good, as did the beautiful outhouses. After that, the celebration began. 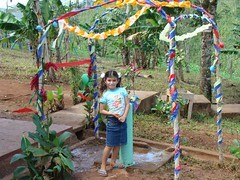 Everything was decorated, with crepe paper around one of the community water spigots. Everybody gathered for speech-giving and celebration, including a local mariachi band (who had come up on horseback with their instruments). Thierry Sciari, the representative of the French organization Res Publica that funded this project, met all the members of the committee. There was the presentation of certificates to each family acknowledging their contribution and their completion of the health and water use training. We were even asked to help with the presentation of some of these things, and asked to give a little speech ourselves, I guess as representatives of other APLV donors! All in all, it was a wonderful celebration of a more wonderful event. Nancy talked to one gentleman who had had health problems (parasites) for years and years and had never been able to shake them before the new potable water system went in. 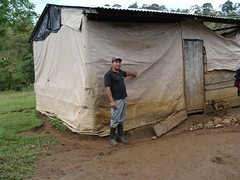 But now, with good water available all the time, he is free of parasites and healthier than he's been in his life. I got to visit the very ambitious water project being at the village of La Enea, which involves capturing the water from a creek high on the other side of a significant valley, bringing it down across the river and then back up the other side of the valley to the village. This is a tremendously ambitious project, the biggest Agua para la Vida has ever undertaken. It involves the capture of part of a stream instead of just a little spring (and might require chemical treatment) and involves something like 37 kilometers of piping, seven kilometers for the basic water delivery and the rest for the distribution system. And the water system will be a tremendous boon to this community, because they currently have to haul their (poor quality) water from a stream four kilometers away. So most either walk with a heavy load of water or perhaps load a burro with a big load. Imagine the time it would take out of your day if you had to personally carry all the water you needed for drinking, cooking, and clothes washing from a source two and a half miles away. My visit was with an entire team from APLV, and there was a major status meeting with the entire community. Most of the meeting was about making sure that the proper amount of community labor was organized, since the community provides all the unskilled labor, as much as 50 man-days of hard labor per family. In the current stage of the project most of the work is using a pick and shovel to dig meter-deep trenches for the piping through rocky, rocky soil. We left the APLV skilled water technicians there when we returned, since they were going to spend the week working with the community laborers to make another push on the distribution line. These young people are so talented and impressive. They almost all come from campesino homes all over Nicaragua and have graduated from the Potable Water Technical School that APLV runs and are now directing and overseeing impressive engineering ventures. All of them would be staying the week in simple accomodations provided by the locals, some a bit more rustic that most of you would appreciate. But no complaining from this talented group. 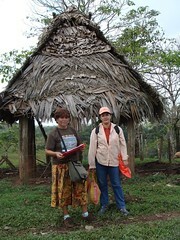 The third village we visited was Monte de Cristo, which is a candidate for a water system and which may get one this year. 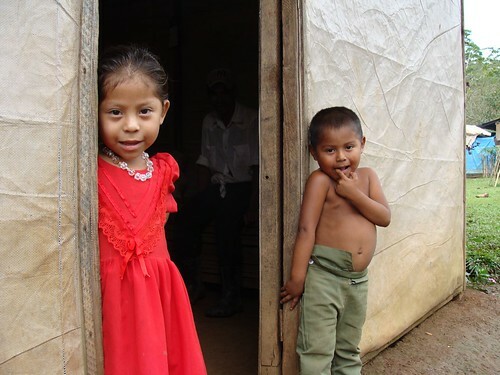 We rode in the back of a truck for an hour and a half or so to get around the huge mountain that rises up beside Rio Blanco, then crossed a river on foot and rode horses for an hour and a half to the village, which is completely inaccessible by vehicle. As novices on horseback, it seemed nearly inaccessible on horseback! The steep, muddy inclines and deep mudholes seemed to us like they'd be too difficult for the horses, but they took them slowly and carefully and got us there safely. Monte de Cristo is a community partially formed by a catastrophe four years ago. A tropical storm stalled over the area, dropping an incredible amount of rain, eventually resulting in huge mudslides coming off of the Cerro Musun, the mountain that dominates the area. 40 people were killed, but villages were wiped out throughout the area, and Monte de Cristo was a resettlement village where the International Red Cross set up some services and some temporary housing (which is still in use, even though intended for only one season). There were two major reasons for the visit: First, APLV normally conducts a number of community-training, health-training, and organizational and planning meetings, so all that was going on. But second, the village was being shown to Thierry, the representative of the French NGO "Res Publica", for possible sponsorship by that organization. We got to see how he approached the entire evaluation process, and how APLV does its various meetings and social organization up front. Nancy will talk more about the visit to this remote village, but it was impressive to see the need, and to see how APLV handles the early stages of the process. We were exhausted when we returned that night!